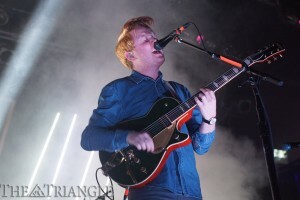 Two Door Cinema Club played the Electric Factor Sept. 29 to a packed crowd. Playing fan favorites like “Sleep Alone” and “Something Good Can Work,” the electro pop band left the small venue swarming with concert-goers. Two Door Cinema Club won itself new fans Sept. 29, after playing an amazing electro pop-filled set at the Electric Factory to a sold out crowd. If you’re not already familiar with the band, which is made up of frontman Alex Trimble, bassist Kevin Baird, guitarist Sam Halliday and temporary touring drummer Benjamin Thompson, the Northern Ireland natives have recently gained publicity and a monsoon of new fans as they skyrocketed into the music scene following their appearances at this year’s Reading and Leeds Festival in the United Kingdom as well as the 2012 Bonnaroo Music and Arts Festival in Tennessee. Nearing the end of the opening bands’ sets, it was evident that the venue had been close to, if not already, sold to its 2,500-person maximum capacity. To paint a better picture of the amount of people in the venue, the band had the entire floor jam-packed and the 21+ bar balcony overflowing with swarms of fans. The show opened with the group Guards, followed by the group Friends, which is a female-fronted five-piece band from Brooklyn, N.Y. Both bands had incredible stage presence and crowd involvement. Though I had never heard of them before the show, I left feeling like a fan of both bands. At one point in their set, vocalist Samantha Urbani jumped into the crowd and serenaded a fan in the front row. For a majority of the night, I often found myself wondering if I was at a concert or watching a trippy light show. Although Two Door Cinema Club’s set was powerful, fun and enjoyable, their distinct sound caused the majority of their songs to sound extremely similar and even blend together at times. The band rarely took breaks between songs to speak to the crowd; instead they made time to play extra songs, which didn’t remotely bother the audience. As the show continued, the crowd turned into a sea of energetic and not-so-sober dancers. The people in the crowd kept the movement going all the way through the three-song encore until their final and most popular song, “What You Know.” Although they’re not my favorite band, they definitely won over my affection. This was my first time seeing them live, but it definitely will not be my last. If you have never been to a Two Door Cinema Club show before, I hope I have convinced you to attend one.